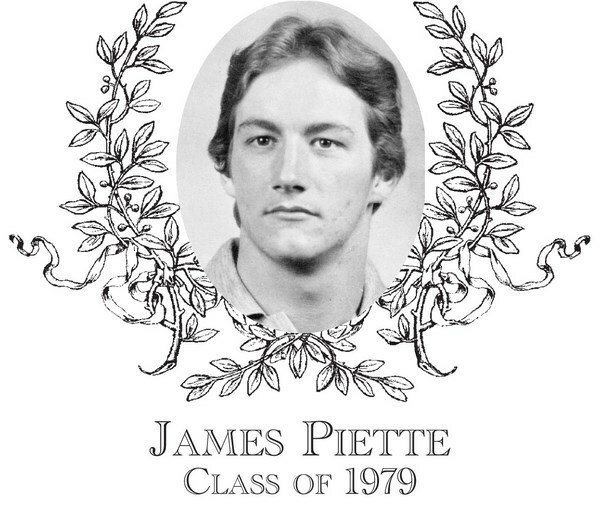 James Piette, Class of 1979, was an outstanding three-sport star athlete for the Indians who co-captained both the football and basketball teams in his senior year. In football, Jim was a punishing runner on offense and a ferocious tackler on the defensive side of the ball. He moved from outside linebacker to inside linebacker in his senior year to take advantage of his keen awareness to diagnose plays and was responsible for making the on-field calls and adjustments that were required. On offense, Jim was a strong inside runner often times running over tacklers. His height advantage, coupled with excellent hands, provided the team with a go to target in play action pass situations. He was both a leading punter and high ranking defender in the Border Conference League. He was averaging double digit tackles a game before being side-lined by a serious injury in the Grafton game. Despite the injury, Jim was in attendance at all practices, constantly encouraging his teammates. Jim was named a Worcester Telegram & Gazette Division 3 Honors Team All-Star. Jim�s leadership skills, along with co-captain Brian Sgariglia�s scoring, were instrumental in leading the team to the Clark Tournament Championship and Bartlett's first ever State Championship Title. Jim, at 6'2" and 175 lbs., played forward. Not only was he a leading rebounder, he had the quickness to defend the opponent's leading scorer. He was also the point person on the tenacious BHS press. He netted 28 points in the opening round of the Clark Tournament against West Boylston. Additionally, who can forget his leading scorer effort and half court buzzer beater shot in the State Championship game! On the Baseball diamond, Jim was a Border Conference All-Star. He was the cleanup hitter and shortstop on the Indians baseball team. Jim was a key contributor to a great 1979 season such as the comeback victory against North Brookfield when he hit a grand slam homerun. Jim was awarded the George Finnegan Award as the top male athlete. Jim and his wife, Rachel, reside in Webster. They have a son Jonathan and three daughters Sarah, Jamie and Molly.